Tell the U.S. Forest Service: Save America’s Largest Wild Forest! Under Trump’s watch, the U.S. Forest Service is pushing to allow destructive logging and road construction in Alaska’s Tongass National Forest — the country’s largest wild forest, and home to countless groves of irreplaceable old growth trees, some more than 800 years old. The Roadless Rule was written to keep wildlands in the Tongass and other national forests safe from invasive road building and logging. The Trump administration’s proposal to roll back this landmark rule is a gift to timber and logging companies that could gain access to millions of acres of pristine, ancient trees and destroy precious fish and wildlife habitat. NRDC has been fighting a decades-long battle to defend the Tongass and other roadless federal forestlands from being ripped open by corporate interests and industrialization, and we will continue to fight this new proposal. But the clock is ticking: There are just days until the public comment period ends on October 15. Raise your voice before it’s too late: Demand the U.S. Forest Service retain the national Roadless Rule in Alaska and oppose destructive road building in the Tongass National Forest. 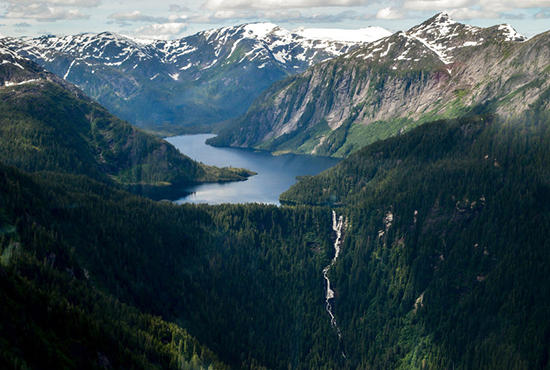 Add your name to demand that the U.S. Forest Service uphold the landmark Roadless Rule to protect Alaska’s Tongass National Forest from destructive logging and other development. There are just days until the public comment period ends on October 15. Dear U.S. Forest Service, I am outraged that you are proposing to roll back the landmark Roadless Rule to allow companies to punch roads into pristine roadless areas of the Tongass National Forest. Cutting down ancient, 800-year-old trees and destroying natural habitats for profit is a national disgrace. The Tongass is America’s largest national forest and the heart of the largest intact temperate rainforest left in the world. It is home to iconic wildlife including brown bears, black bears, bald eagles, timber wolves, and all five species of Pacific salmon. The Tongass is also the country’s most important national forest for carbon sequestration and climate change mitigation. With parts of Alaska warming at roughly twice the rate of the planet’s average speed, maintaining this critical ecosystem advances climate change solutions for both our national and international climate efforts. It is your responsibility to do everything you can to ensure this pristine national treasure is safeguarded for generations to come. Once it is gone, it is gone forever. I urge you to reverse course and protect the Tongass National Forest from destructive roadbuilding and logging. Thank you.